Amazon has made Alexa an artificial assistant which works and gell wells with smart home and internet of things smart devices. Alexa is capable of performing various tasks and make life easy for you. Amazon today announced that Alexa, the brain that powers Amazon Echo, is coming to India, along with three Alexa-enabled devices: Echo, Echo Plus, and Echo Dot. From the beginning since the introduction of the Alexa to the world, Amazon is open to developer community or rather reliant on the developer community to make more applications which are Alexa Compitable. More apps would ensure that the more tasks can be done and wide usability from the consumer. Adding as a help or boost to the developer community Amazon has given an option to customers who want to further the development of Alexa or Echo family may request an invitation to purchase devices beginning today at www.amazon.in. As a thank you, for a limited time, eligible customers will receive an introductory discount of 30% off the purchase price of Echo devices and one year of Prime membership. Devices will ship beginning the week of October 30th. Echo, Echo Plus, and Echo Dot are voice-controlled speakers designed entirely around your voice—they are always ready, hands-free, and fast. Alexa is the brain behind Echo—since Alexa runs in the cloud, the service is always getting smarter. Just ask, and Alexa will answer questions, play music, read the news, set timers and alarms, check the calendar, provide sports scores, control lights at home, and much more. With Echo’s far-field voice control, you can do all this from across the room using just your voice. These speakers are just the beginning and soon Alexa would be able to control your home through voice. In India, Alexa delivers a customised Indian experience, including an all-new English voice with local pronunciations and intonation; support for music titles, names, and places in additional non-English languages; local knowledge; and local skills from Indian developers. Third-party developers in India are already building new, localized skills for Alexa, and over 10,000 skills will be available for customers in India, including skills from Saavn, Times of India, ESPNcricinfo, Ola, Freshmenu, and more. Amazon Echo has been fine-tuned to deliver crisp vocals with a dynamic bass response. Its 2.5” down-firing woofer, dedicated tweeter, Dolby processing, and 360° omnidirectional audio deliver crisp vocals and dynamic bass throughout the room. Echo can stream music directly from popular music services such as Amazon Prime Music, Saavn, TuneIn, and more. Echo is also Bluetooth-enabled so you can stream music directly from your phone or tablet. Amazon Echo is designed to disappear into your home. Pick from a variety of shell colors and finishes to fit into your home’s décor—choices include charcoal, sandstone, and heather gray. Echo Plus includes all the features of Echo, including room-filling sound powered by Dolby and a far-field microphone array, and adds a built-in smart home hub. With the built-in smart home hub, Echo Plus makes connecting to compatible smart home devices easy. Just say “Alexa, discover my devices,” and Echo Plus will automatically discover and set up compatible lights, without the need for additional hubs or apps. This simple set-up works initially with a variety of ZigBee-supported products from Philips Hue. Echo Dot is a hands-free, voice controlled device that is powered by Alexa and uses the same far-field voice recognition as Echo. Echo Dot has a sleek and compact design, comes in either black or white, and is designed so you can put an Echo Dot into every room. Use the built-in speaker to talk with Alexa and listen to music, or Echo Dot can directly connect to speakers through Bluetooth or by using a 3.5mm stereo cable, enabling you to add Alexa to any home entertainment system. Amazon Prime Music will soon be available as an exclusive preview to invite-only Echo customers at no additional cost. Customers can enjoy their favorite music ad-free and on-demand across a wide catalogue of English and multiple Indian language songs. Listening to music with Alexa is as simple as saying “Alexa, play Bollywood songs” or “Alexa, play Arijit Singh songs.” If you’re in the mood to relax, say “Alexa, play smooth jazz,” or for your morning workout, simply say “Alexa, play my workout mix.” Amazon Prime Music is coming soon exclusively for Prime members at no extra cost. Use Echo, Echo Plus, and Echo Dot to switch on the lamp before getting out of bed, or dim the lights from the couch to watch a movie—all using just your voice. Alexa works with devices such as smart lights and plugs from brands including Philips, SYSKA LED, Oakter, TP-Link, and more. If you have multiple Echo devices within hearing distance, Amazon’s ESP technology intelligently calculates the clarity of the your voice and determines which Echo is closest and should respond to the request—instantly. This feature is smart—performance gets better over time, so ESP will continuously improve as you use Echo. In multi-Echo households, ESP resolves the problem of two Echo devices answering you at the same time. Developers can use the Alexa Skills Kit (ASK) to build skills. More than 10,000 skills will be available at launch with Alexa in India. These skills add even more capabilities like ordering a favorite takeaway from popular services like Freshmenu or Zomato, requesting a ride from Uber or Ola, preparing dinner with the help of recipes from Tarla Dalal and more. 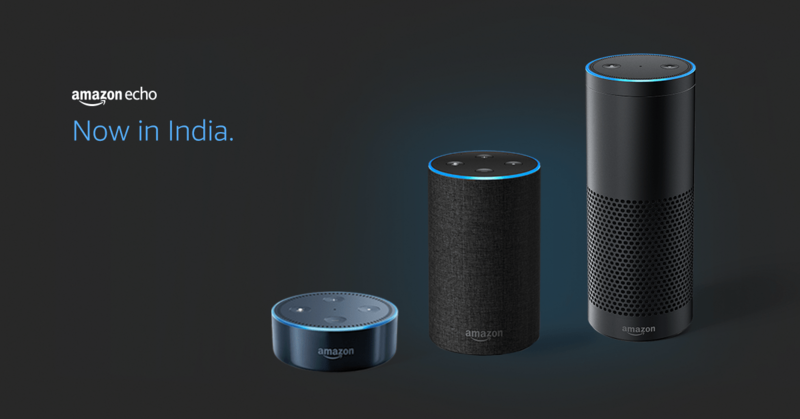 Echo, Echo Plus, and Echo Dot are available by invitation to customers who want to help shape and develop Alexa and the Echo family of devices as they evolve in India. Request an invitation to purchase Echo at www.amazon.in/echo, Echo Plus at www.amazon.in/echoplus, and Echo Dot at www.amazon.in/echodot. For a limited time, eligible customers will receive an introductory discount of 30% off the purchase price of Echo devices and one year of Prime membership. Devices will ship beginning the week of October 30th. Echo, Echo Plus, and Echo Dot will also be available at Croma, Reliance Digital stores and other offline retailers following the invite-only period.